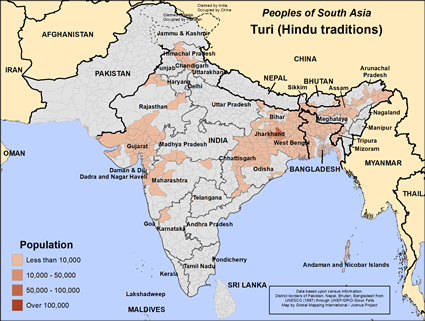 The Turi are a Dravidian Hindu group of people who live in Bangladesh and northeast India. These Turi are not to be confused with the Turi Pashtun tribe who live in Pakistan and Gujarat, India. The traditional occupation of the Hindu Turi is that of making useful things from bamboo. These items include many types of baskets, mats, hats and furniture. Other Turi work as landless agricultural laborers. Illiteracy is an issue among the Turi. Over one third of them are unable to read or write. 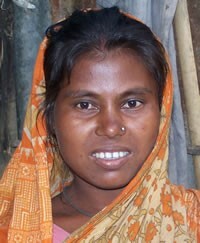 The primary language of the Turi people of Bangladesh is Bengali. Most Turi of Bangladesh live in the states of Rangpur, Rajshahi and Chittagong. The Turi lead challenging lives. Many other groups of Hindus will not associate with them or accept water or food from them. They are frequently not allowed to live in inter-caste villages. They are thought to be Dalits or Outcastes. The Turi often struggle to put food on the table for their families. With the introduction of international trade, the Turi's bamboo products are not as much in demand as they used to be. The Turi who work on farms are often at the mercy of the landowner. The Turi marry within their caste but not within their clan or gotra. Families arrange marriages. In past times, the Turi girl babies were contracted in marriage soon after their births. This practice of child marriage is fortunately disappearing. Sons inherit the property of their fathers. Newly married couples live with or near the groom's parents. The Turi bury their dead. The main foods of the Turi are rice, curries, vegetables, other grains and fruit. As Hindus, the Turi do not eat beef. Almost all Turi practice Hinduism, the ancient religion of the Indian subcontinent. They worship and serve the gods of the Hindu pantheon. Their principal deity is Singbonga or the sun, the great god of the Mundas. The Mundas are the larger group of people from which the Turi originated. Hindus believe that by performing rituals and good works that they will attain moksha or freedom from the endless cycle of birth, death and rebirth. The Turi are often denied entrance into Hindu temples due to their Dalit designation. The Turi offer prayers, food, flowers and incense to their gods at their own shrines. They employ their own priests, as Brahmins will not serve at their important life events. The main yearly holidays of the Turi people are Holi, the festival of colors, Diwali, the festival of lights and Navratri, the celebration of autumn. The Turi people have pressing needs. They need help in educating their children. They need help in acquiring electricity, access to clean water and indoor plumbing. They need help in gaining new job skills. Most of all, the Turi need to hear and believe in the life-changing message of Jesus Christ. * Pray that God turns the Turi away from Hinduism and into the loving arms of God the Father and His Son Jesus Christ. * Pray for Turi families and communities to discover and embrace the free gift of life found by trusting Christ and his finished work. * Pray for the Holy Spirit to work powerfully through those Christians ministering to the Turi people. ethnologue.com/language/trdView Turi (Hindu traditions) in all countries.